Alaska West Express truly walks the talk when it comes to handling and transporting hazardous materials over challenging terrain with the utmost respect for safety, pollution prevention and the environment. Over the last five years, Alaska West has transported an average of 14 million gallons of fuel annually with no accidents. This year alone, drivers have traveled nearly 5 million miles without a recordable accident. Since joining the EPA SmartWay Transport Partnership in 2012, Alaska West has increased fuel efficiency by 25 percent while increasing the average payload by 10 percent. This means moving freight with less fuel and an overall 26 percent reduction in CO2 emissions per ton mile. 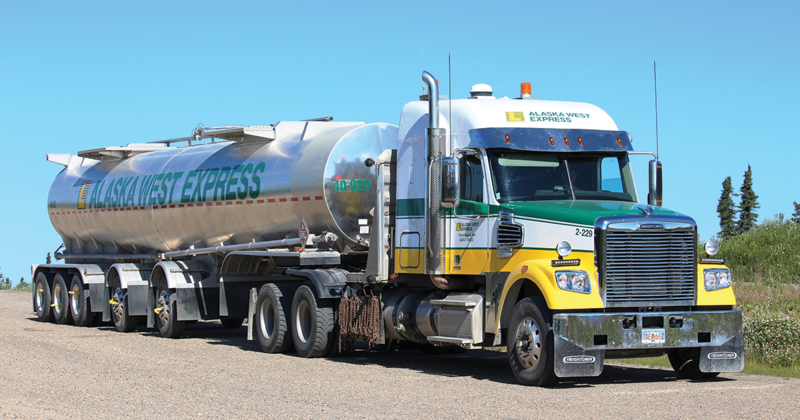 "Over the last several years, we have continued to make Alaska West Express’s trailering equipment more efficient," explains Alaska West Express President Eric Badger. "Our 406 and 407 tanker fleet is predominantly 5-axle, leading to a dramatically increased payload while reducing fuel consumption and number of trips. 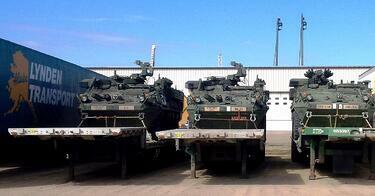 We have also purchased eight DOT 407 chemical tanks to allow us to haul over 2,000 gallons more per load." Earlier this year, Alaska West Express took delivery of 10 Wilson aluminum 53-foot 5-axle flatbed trailers providing a 72,000-pound payload. They also feature a tire inflation system with heat-sensing devices that will alert the driver to an elevated wheel-end temperature. Alaska West drivers helped test the system from prototype to production. According to Director of Maintenance Tommy Douthit, auxiliary power units provide heat and power to the cab when the truck is turned off and have helped reduce idle time by over 40 percent. Tire pressure monitoring equipment and laser alignment of tires reduces tire wear and also contributes to fuel efficiency. Newer, more efficient engines, combined with the improved fuel economy and payload, have led to a 39 percent reduction in particulate matter emissions and an 83 percent reduction in nitrous oxide emissions. "This contributes to better air quality in places like Anchorage and Fairbanks where winter inversions can trap pollution," Tommy says. The Fairbanks line haul fleet is equipped with an onboard oil filtration system that allows maintenance to stretch out oil changes from 750 hours to around 2,500 hours or more. "We are only performing full oil changes on an annual basis now," Tommy says. "This translates to about a 75 percent reduction in engine oil use. Nothing goes to waste, as used oil from the trucks is then used to heat the parts warehouse in Fairbanks." The company is also testing a disc brake pad free of copper and other metals to meet an upcoming EPA requirement to preserve sea life in the Pacific Ocean. Efficiency is not limited to equipment. Over the last several years, Alaska West’s Fairbanks facility has converted nearly 90 percent of its lights to LEDs which have dramatically improved lighting quality and led to a savings of $50,000 per year in electricity costs. "This year, we also upgraded our primary heating system boilers to improve efficiency and added propane fired air exchangers to augment our floor heat. This gives us faster recovery time and quicker thaw cycles for our equipment to allow us to haul freight in snowy conditions," Tommy says. Parts of a vintage 727 jetliner were strapped to an Alaska West Express trailer at the Future of Flight Museum in Everett and hauled to a hangar at Columbia Pacific Aviation in Moses Lake, WA. The noteworthy move was covered by Seattle's KING–5 TV and Alaska West Express Driver Tom Lardie was featured on that night's newscast. The museum closed after 13 years and all the planes were taken down from the ceiling and hauled to new homes at other museums or moved into storage. "Dispatcher Roger VanMeter set this move up and knocked it out of the park," says Tacoma Service Center Manager Neil Cranford. "His planning and communication with the customer and driver insured that this freight moved without any damage or issues. It should also be noted that our driver, Tom Lardie, handled the move with the utmost professionalism. Having experienced drivers like Tom makes hauling oversize freight such as this possible." The fuselage was part of the original team plane for the Vancouver Canucks hockey team. According to Tom, it drew quite a bit of attention rolling down Interstate 90 from Western to Eastern Washington. A recent project for a return customer involved four Lynden companies and three modes of transportation. 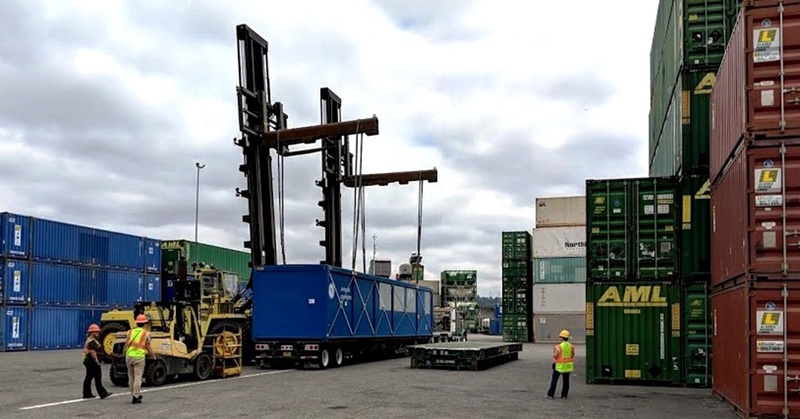 Lynden International was called upon to move three 56-foot power generation modules plus three 40-foot containers of supporting equipment from Europe, to Seattle and then on to a remote location in Canada. The project spanned two months and involved many twists and turns. Planning for the move took almost a year and Lynden’s carefully coordinated delivery was moved up a month when the customer’s equipment was finished ahead of schedule in June instead of July. The delivery of the oversized freight required planning and coordination with the project lead for ‘just-in-time’ delivery of each component. "The pieces were collected in the middle of Europe, trucked south to the port and sent via ocean to Seattle where Alaska West Express took over to get them to Canada. Lynden International filed a temporary import into the U.S. for the customer, then we moved the freight inbound on Alaska Marine Lines’ bond," explains Paulette Shatara, Lynden International Director of Business Development, in Houston. Lynden used heavy haul trucks with specialized shock-protected trailers to move the valuable pieces from the factory, to the port for loading onto the vessel. It was a two-day journey of more than 400 miles, requiring permits and 56-foot trailers. One of the modules weighed more than 100,000 pounds. The project also involved coordinating air shipments for paint and other hazardous materials. Once the pieces arrived in Seattle, they were carefully offloaded from the vessel onto waiting trailers and loaded onto a north bound Alaska Marine Lines barge. Alaska West Express and Canadian Lynden Transport drivers transported them to the final destination. "The successful completion of this project was the result of the cooperative efforts of Lynden International, Alaska Marine Lines, Alaska West Express and Canadian Lynden Transport," says Alaska West Express Project Manager Steve Willford. Steve also recognized Drivers Gary Ridall and James Elliot for getting the modules into the delivery site safely and the close support, advice and cooperation received from the Canadian Lynden Transport team. Lynden companies have served the government and the Department of Defense (DOD) for decades by providing reliable transportation services, emergency aid, logistics planning and more via air, land and sea. "We offer one of the most logistically diverse transportation services in the world. From flying weekly missions to air bases in Germany and Japan, to mobilizing shipments for Operation Enduring Freedom and Federal Emergency Management Agency (FEMA) disaster response, we understand the unique challenges and deadlines of military and government projects," says Eric Wilson, Lynden Transport's Director of Pricing in Seattle. Lynden has a Government team to ensure military projects are efficiently planned and executed. Each member of the group has military clearance to view project websites and bid on jobs. "Alaska Marine Lines is taking on more military moves in both Alaska and Hawaii, and Lynden Transport is serving the military on moves to, from and within Alaska installations," explains Jim Earl, Sales Manager at Alaska West Express. Lynden Transport is approved by both the U.S. and Canada as a DOD carrier, and recently handled 80 loads from Fairbanks, AK, to Canadian Forces Base (CFB) Wainwright, approximately 100 miles from Edmonton within a two-week deadline. Alaska Marine Lines is a Universal Services Contract (USC-8) approved carrier for the military's Surface Deployment and Distribution Command (SDDC) and handles moves to and from Alaska and Hawaii. Alaska West Express continues to provide specialized hauling in both the Lower 48 and Alaska with dual drivers and satellite tracking for sensitive shipments. Other Lynden companies have also provided support to government needs. Lynden International has been assisting government and non-government organizations with transportation and logistics in West Africa since the Ebola crisis in 2014. Lynden Air Cargo has conducted flights through Diplomat Freight Services (DFS), FEMA, the Red Cross and other supporting agencies and governments to bring in food, water, trucks, fuel and other disaster response supplies to ravaged areas. To learn more about Lynden's military and government capabilities, please view our brochure at www.lynden.com/about/brochures/Government_Military.pdf or contact our team at information@lynden.com. Lynden International's Anchorage crew has coordinated many charters, but rarely do they involve one of the world's largest commercial cargo aircraft, the Antonov 124. "When one of our customers 'rings the bell' and needs an 82,000-pound, 60-foot-long, 11-foot-high mud pump house for their North Slope Exploration project, guys like Jeff Pennell, Regional Operations Manager with Lynden International, answer the call," says Senior Account Executive Nick Karnos. In his 32 years at Lynden, Jeff says there have only been a handful of times he had to hire an aircraft this big to haul freight. "It's no big deal to make this type of move happen," he says modestly. "This is no different than any of the other charters we set up, the freight and the airplane are just a little bigger." But, in fact, the move was a big deal. The customer was losing almost a million dollars a day waiting for the emergency freight with a crew and drill rig standing by. It required finding the specialized aircraft, coordinating the movement of freight from the shipper in Houston to the airport, loading equipment on the ground, ground handling and the subsequent movement from Fairbanks to Alaska's North Slope. Jeff relied on the expertise of Steve Willford, Project Manager with Alaska West Express in Fairbanks for specialty equipment and handling. Once the freight arrived in Fairbanks, it was unloaded, trans-loaded to a separate trailer, then sent 400 more miles to Deadhorse. From Deadhorse, it went over an ice road to an island in the Arctic Ocean where crews were waiting. 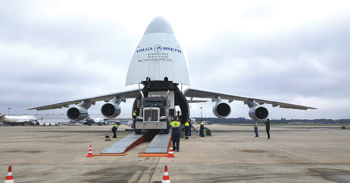 "And if the move wasn't complex enough, Jeff added 20,000 pounds of wire spools to the Antonov load since there was more space available," Nick explains. The AN-124 eventually landed in Fairbanks at 2:36 a.m., where Alaska West Express was already positioned to get the freight moving north to Prudhoe Bay. "Round-the-clock communications and near constant updates on the cargo, aircraft and other equipment are appreciated by all stakeholders, but a little tough on the sleep cycle for guys like Jeff and Steve, not to mention our customers," Nick says. "This project started with inquiries to Lynden Transport, Alaska West Express and Lynden Air Cargo for solutions, then it fell squarely into Lynden International's scope," Nick says. "It was truly a One Lynden project." 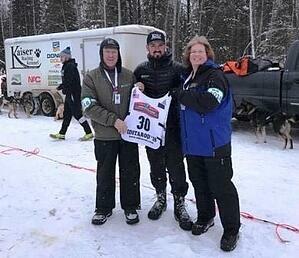 In the photo right, Alaska West Express Driver (and 2017 Overall ATA Winner of the Truck Driving Rodeo) Brian Ambrose and his wife Jennifer wished Pete Kaiser (center) luck at the end of the 11-mile ceremonial start of the Iditarod sled dog race in Anchorage. The real race started March 3 in Willow, AK with Pete competing for the tenth time. He placed fifth – a big jump from his ninth-place finish last year. The Ambroses are long-time race volunteers. "Jennifer and I are part of a group of volunteers who collect the bibs from the mushers and have them autographed so they can be auctioned off to raise funds for the race," Brian says. 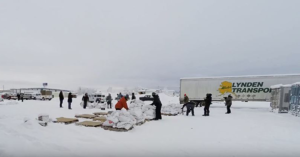 Lynden continued its tradition of donating transportation of food and supplies for the 2018 Yukon Quest 1,000-mile sled dog race this winter by participating in the annual Fairbanks Food Drop event in January. Alaska West Express Drivers Brian Ambrose and James Elliott picked up freight in Whitehorse to support the mushers and their dog teams. Lynden Transport is also an event sponsor. Canadian Lynden Transport Dispatcher Deanna Benson received a call from race organizer Alex Olesen one day. "He said his uncle was curious about how things were going with the shipment," Deanna says. "The uncle turned out to be Lynden retiree Steven Reilly. What a small world!" Image from the Yukon Quest video. View the video and the food drop process at https://youtu.be/t5ijcCWoTvk?t=45. Three Lynden drivers qualified for and participated in the National Truck Driving Championships Aug. 9-12 in Orlando, FL. More than 400 drivers competed in the event which is a gathering of the best-of-the-best truckers from California to Maine. Brian Ambrose of Alaska West Express took 15th place in the Sleeper Berth, Jack Sorensen of Lynden Transport placed 32nd in the Tank Truck category and Edward Tuia of Alaska West Express came in 41st in the five-axle. 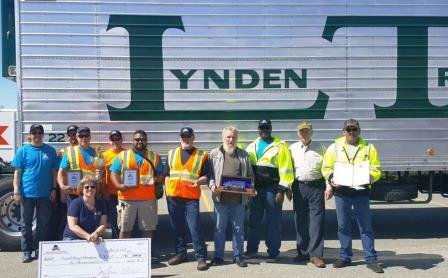 Congratulations are in order for many Lynden drivers who competed in truck driving competitions in Alaska and Washington this spring. At the Alaska Trucking Association’s (ATA) annual truck rodeo in Anchorage, Alaska West Express Driver Brian Ambrose was named overall champion for the second year followed by Eddie Tuia in second place. Eddie also took first place for Alaska West Express in the 5-axle van category with Doug Longerbone of Lynden Transport taking second place. Other first-place finishers included Jack Sorensen in the Tanker and Brian in the Sleeper Divisions. Al Guettinger and John Schank took first and second places respectively in the Old Geezer category. John was also named 2017 Alaska Driver of the Year for the second time. Other Lynden drivers competing were: Randy Estrada, Lynden Transport, third in the flatbed category; James Elliott, Alaska West Express, tenth in the 5-axle; Greg Sims, Lynden Transport, eleventh in the 5-axle; Tanner Heisler, Lynden Transport, fifth in the 4-axle; Ray Sorenson, Lynden Transport, fifth in the 3-axle and Clayton Bonty, Lynden Transport, sixth in the flatbed division. Dan Jenkins of Lynden Transport competed in the Washington competition, placing fourth in the flatbed class. "We are always proud of the drivers who come out to represent the Lynden companies," says Richard Hennagin, Lynden Transport Safety Supervisor. "They are up against the best in the business, which makes their top place finishes even more impressive." The annual Earth Day celebration is a good time to recognize Lynden employees who continue to do more with less, decreasing their energy use while improving safety and productivity. Since 2008, nearly 50 energy efficiency upgrades at Lynden facilities have led to the reduction of 2,350 megawatt hours of electricity and nearly 7 million British Thermal Units (BTUs) of heating fuel and natural gas per year. According to Anna Deal of Lynden’s Green Initiative, that’s the equivalent of the average energy used in 167 homes or 335 passenger vehicles in one year! "Some of the most impressive reductions at Lynden have come from steady and consistent efforts and continuous improvement," she says. For example, Lynden Transport’s Anchorage Service Center has reduced its heating fuel use by 20 percent over the last eight years by repairing insulation, sealing air gaps in the dock doors and dock plates with rubber, and installing new dock shelters. Most recently, a new direct digital controlled thermostat is reducing natural gas use even further. The Anchorage team invested in a series of lighting upgrades that has reduced electricity use by 20 percent, despite adding eight electric forklifts. "One of the unexpected benefits of using electric lifts is the CO2 fan no longer kicks on in the cross-dock," says Richard Hennagin, Lynden Transport Safety Manager. "In a way, the lifts run for free because the fans are no longer pushing warm air outside or using electricity to run." Similarly, the LTI, Inc. Service Center in Lynden, WA has reduced its overall electricity use by 37 percent since 2008. Employees have upgraded old lighting and HVAC systems, installed LED lights in the remodel, and most recently, yard lights were replaced with LEDs. "One of the most exciting changes in the last few years is the number of Lynden facilities moving to LED lights," Anna says. "These lights give better quality light that mimics natural daylight while using a third of the energy. They last longer, so don’t need to be replaced as often. They are dimmable and turn on instantly, so they work well with smart sensor technology and there’s no mercury to dispose of when they do burn out." Alaska West Express in Fairbanks has some of the highest energy costs of any Lynden facility due to a lack of energy options, cold temperatures and the size of the 30-acre facility. Over the last few years the team replaced high wattage lights in the maintenance and tank-cleaning facilities as well as 76 yard lights with energy efficient LED lights. They reduced their electricity usage by 14 percent with a 2.5 year payback to recoup costs. "The best part is, the guys in the shop don’t have to wear their headlamps around anymore," says Gage Schutte, Alaska West Express Service Center Manager. Alaska Marine Lines began testing LED lights in the Seattle yard in 2015. "With a payback of less than three years and a 20-year lifespan, it seemed like a no-brainer," says Mark Gaska (now with Alaska West Express in Tacoma). Since then, M&R interior and exterior lights and salt tent lights have all been replaced with LEDs and smart sensors that adjust lighting output based on daylight levels and movement. Most recently, Alaska Marine Lines in Seattle became the first port facility in the world to use stadium style LED lights to light the yard. "The truck entry lane in Yard 5 needed additional light for safety and security. Rather than disrupting operations and trenching power to install a new pole, we decided to use high mast LED lights. The difference is literally night and day. The safety crew and especially the night crew are very happy," says Tom Crescenzi, Alaska Marine Lines Service Center Manager. Lynden Transport in Fife recently replaced lighting in the cross dock and yard (see photo on page 1). "The biggest benefit is safety," says Keith Johnson, Safety Supervisor. "After we moved to electric lifts, you couldn’t hear the lift approach over the buzzing sound of the old lights. The LED lights are quiet and the crew is able to read paperwork without going to the forklift for light." Lynden Transport Service Centers in Soldotna and Fairbanks also recently replaced their yard lights with LEDs. "Even with all of the reductions at Lynden facilities to date, there is still a huge opportunity to reduce energy use further," Anna says.